It is April 17 and I already have to mow my lawn. 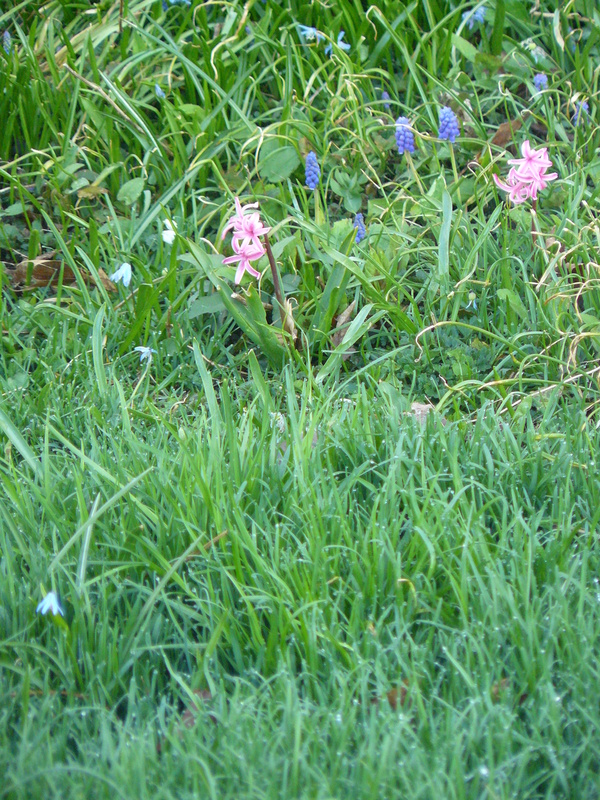 Not the whole thing, just a portion of it that has been relentlessly ahead of the rest of the lawn in growth for the fourteen years I have lived here. If not for this one patch of the lawn, I might be able to comfortably confine my mowing to every ten days, maybe even two weeks. But no, this one patch is truly prolific, not just in height but in density too, rich thick green grass that just keeps on coming. I noticed it this morning on my way out with Yankee for our walk, a true spring morning with hints of forsythia blossoming everywhere and the expanses of new growth on every lawn, like tightly woven blankets of bright green just laid down. 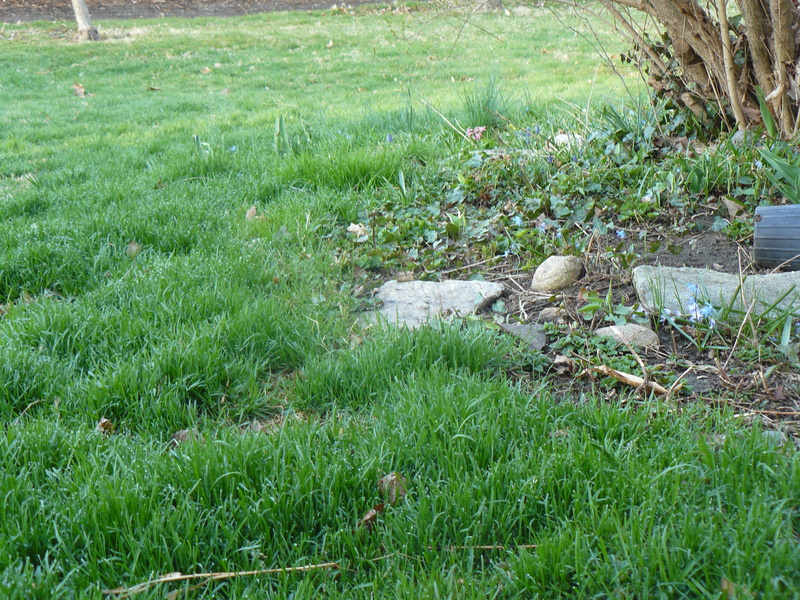 This one patch of my lawn has been a mystery all these years, located at the base of the beautiful old lilac in front of the kitchen window. I’m sure there is a scientific reason for it, but I don’t know what it is, so my imagination runs amuck. Is it from the electric wires that run from the garage out to the light pole at the front edge of the lawn? Is it from the copious amounts of pee delivered by Yankee in this spot, which kills grass everywhere else but seems to be absorbed with grace in this particular place. Is there an energetic line running through this very spot, a beacon of the Earth’s inner light? Maybe it is a pool of water underground that provides extra special nourishment. Or is there something magical about the roots of this lilac spreading and communing with the ground underneath this plush grass. Or maybe something buried in the soil that is continually life renewing in the best sense of sustainable. I just don’t know. I suppose it’s a little bit like nutrition these days. We eat something and we feel good. We eat something else and we feel bad. I am still shocked at what seems to be a non-existent regard the medical community has for the chemistry of food and how it affects every system in our bodies. I get it, that it is an overwhelmingly complex proposition to consider the infinite combinations of proteins and carbohydrates that are possible with the vast variety of foods available to us these days. Add this to the complex emotional relationship we have with food. And yet, we still need to make choices, and presumably good choices that will support our health in some way. Someone can objectify what might be good for us to consume, but in the end, we only have our own awareness of what feels good and what doesn’t. 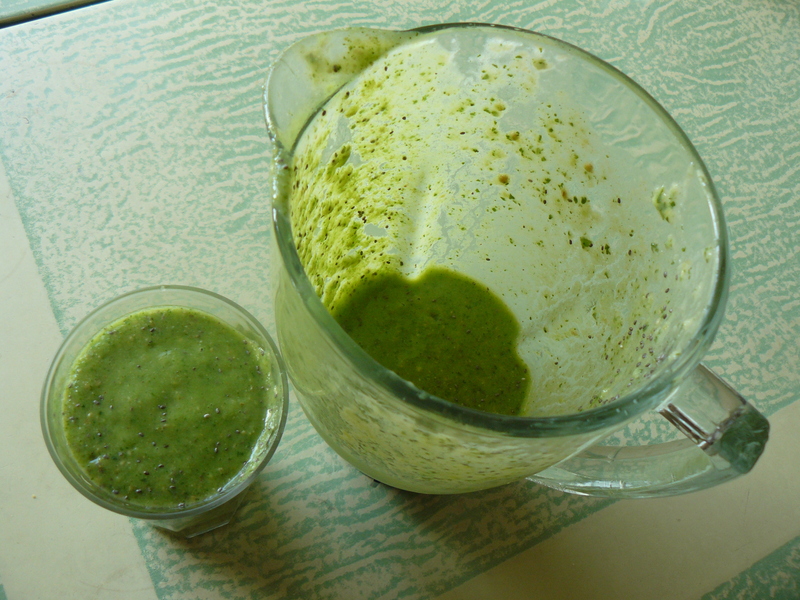 For the past year or so, I have watched the ‘green smoothie’ craze take hold. 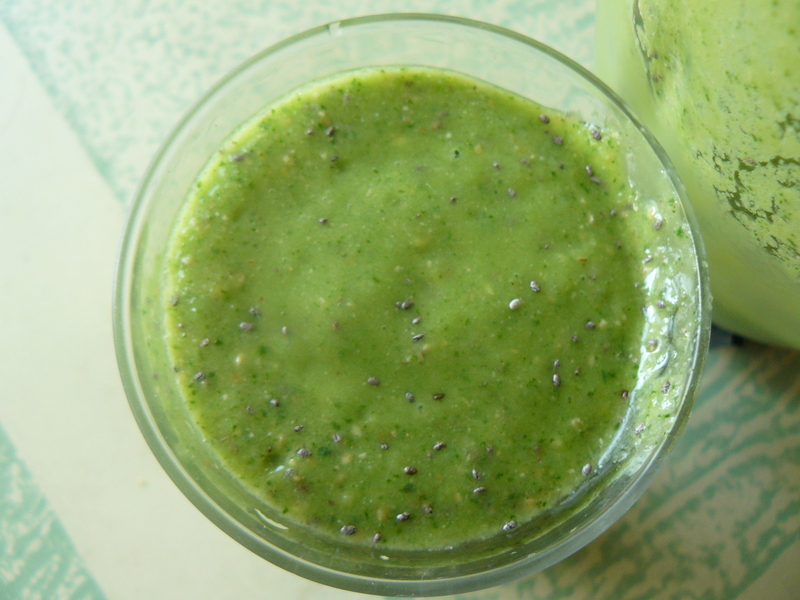 No longer considered a radical health alternative, the varieties of green smoothies are as plentiful and common as the endless varieties of granola we now have to choose from. And still, I haven’t really experimented with it until now. During a recent visit with my parents, my mother asks me if I want some smoothie. Sure! I sit and watch while she proceeds to wash some leaves of kale, a piece of cucumber, and a stalk of celery (all organic of course). She retrieves some mango chunks out of the freezer and peels a banana. She gives me a choice of liquids and I choose coconut milk. She adds the kale to the blender first with some liquid and after that has processed down a bit, adds the rest of the ingredients and in just a minute, we have a green smoothie. It is delicious, slightly chewy from the kale, just the way I like it. It FEELS good. I feel good. Mom makes some version of this every day, and she shares her formula with me. Three fresh organic green vegetables and two fruits with a liquid source of choice, could be some form of milk or yogurt, depending on constitution or sensitivities. Back home, I practice, and make my first green smoothie exactly the way my mother demonstrates except I substitute avocado for the cucumber, and then add a tablespoon of chia seeds at the end for some protein. Yum. And I know, avocado is a fruit, and I changed the formula here by making it three fruits and two vegetables. But it works for me and it still feels good and fills me in a sustaining way. I’m not hungry all morning and I love the thought of the nutrient rich soil I am cultivating in my body…and even imagine what form of plush green grass will now grow from me, smile….